Ashbourne Telegraph review, written by Janet Allison Brown. Anyone walking through the frosty, Christmas-lit streets of Ashbourne last Saturday might have been alarmed to hear the sound of stamping, singing and shrieking laughter coming from St. John’s Church on the Buxton Road. Fear not! It was only the sound of a packed audience rocking the pews during a rowdy rendition of The Twelve Days of Christmas at the Ashbourne Singers’ traditional seasonal concert. This was the third Christmas Concert offered by the local choir, which was founded in September 2007 by Linda Perry Smith. 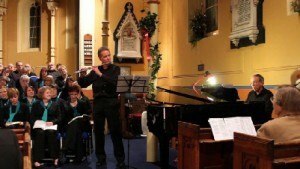 It featured a varied and invigorating programme of music including a host of close-harmony carols, a joyful rendition from Handel’s Messiah, an enchanting performance of Mozart’s Adagio in D by flautist John Barber and a witty rendition of the classic Baby, It’s Cold Outside by Liz Grime and Rob Morton. Amazing Grace, in particular, had many of the audience and the choir in tears, with its stirring harmonies and a crystalline top line delivered by Linda. Ashbourne Singers remain that rare thing: a community choir for those who love singing, and an opportunity for individuals to develop and showcase their talent. The growing number of choir members, and the packed pews on Saturday, reflect just how popular the concept is!